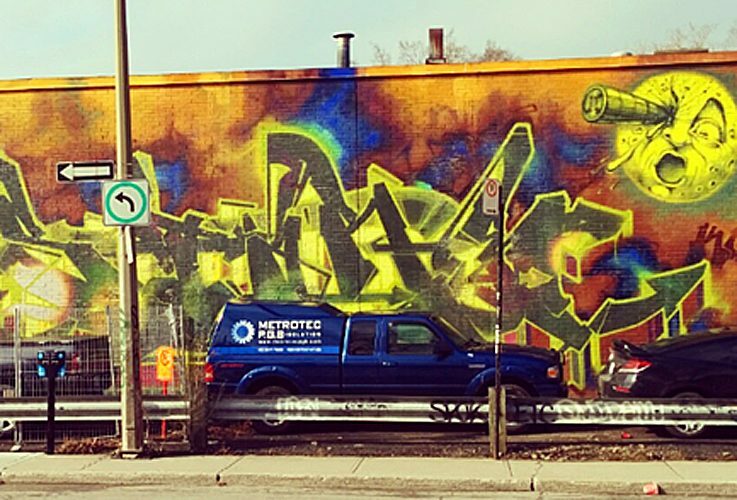 is one of the best-known Montreal graffiti artists. He started as a writer, a millieu he still pursues today. Over time, he turned to walls, and is now considered one of the best street artists in the city. His mostly legal graffiti are rarely the target of taggers, which is the sign of ultimate respect from his peers. If you have been around Montreal has © Stare, Photo: Aim Pé certainly seen some of his works, his large-scale colorful works are an integral part of the cityscape. A striking feature of Stares work is the change between adventurous color schemes and electrifying effects. He is also part of the collective Art du commun, which has been active since 2006 (a French pun on "Hors du commun" - Extraordinary). The collective emphasizes that every creative process takes into account the history and experience of the location of a work. The positioning of each mural, according to the site of Art du commun, thus creates a space for social interaction and offers passers-by an original and timeless visual experience. 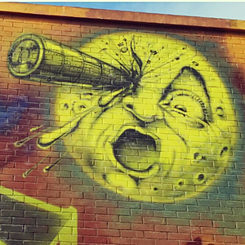 The pictured moon face in the artwork pictured here pays homage to Georges Méliès' fantastic movie "Le Voyage dans la lune" from 1902.